Salam Ramadhan to all. This entry is actually a request from kak Aniza for my Bun Ikan Bilis that I baked a few days before Ramadhan for Melani in Lucan. I baked extra to give it to kak Aniza for her and family to thank their kindness for bringing so many things from back home for us.. Thank you so much sis. 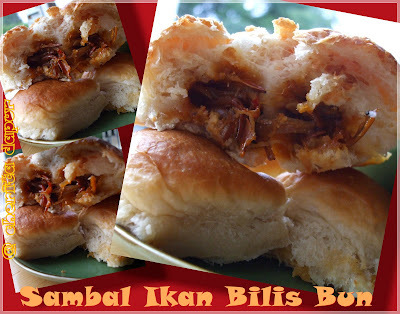 To kak Aniza, I used the same recipe as my buns before but I added 1 tsp of bread improver and 1 tsp of bread softener. . I thought that make the buns so soft and yummilicious... Anyway, for my friends out there who would like to try the recipe of this bun, you can click here for the recipe.